None Soft Nylon Cover (+$29.99) Protect your poker table with a stretch, water resistant nylon cover. The Nighthawk poker table has been updated with our newly designed column pedestal leg and upgraded table surface materials. It was great before, now it's just ridiculous. What do you do when an impromptu poker game breaks out? We'll, if you have a Nighthawk you would just take off the dining top and start calling bluffs! 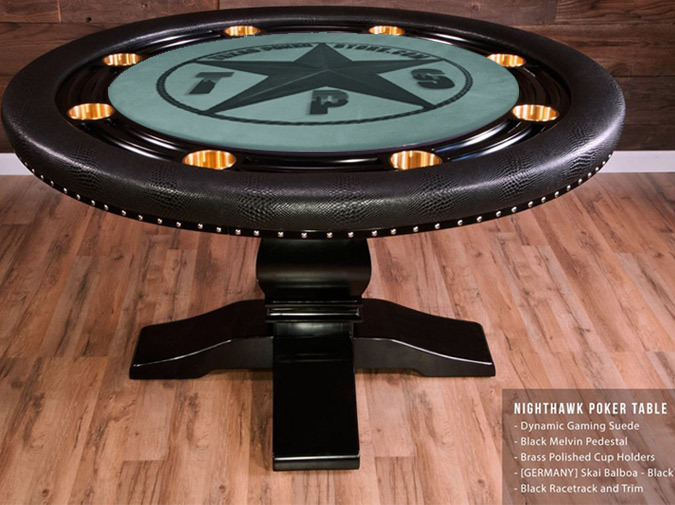 One of our best selling tables, the Nighthawk is a versatile eight player poker table that does not take up too much of your space. 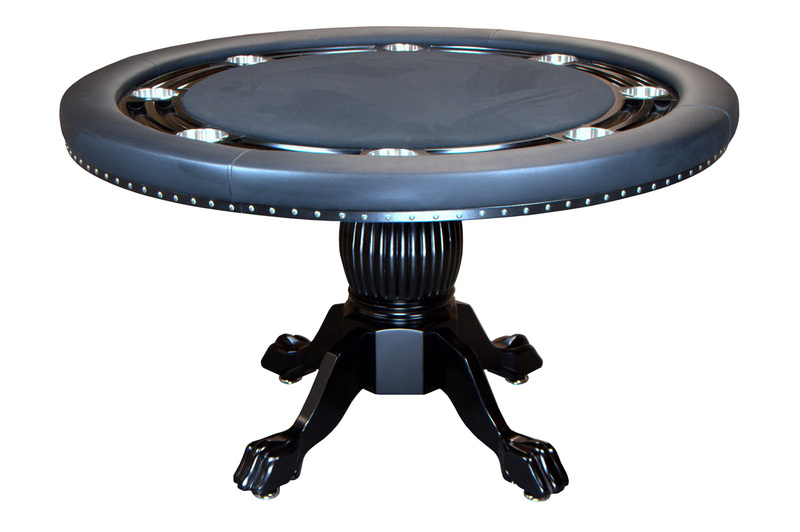 The Nighthawk has a built in chip rack racetrack for each player and sits on a solid oak pedestal. 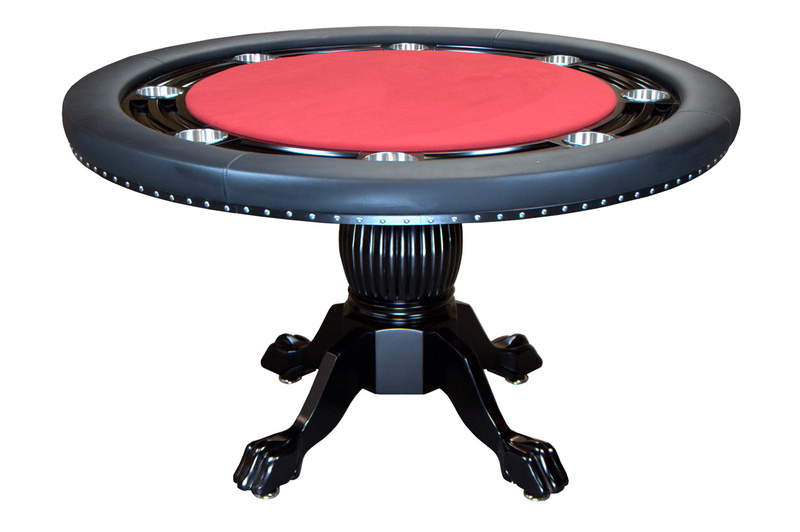 The table has a removable playing surface which allows easy playing surface changes whenever you feel like looking at something new. The premium black gloss finish is scratch resistant, and matching dining top and chairs allow a inconspicuous dining configuration when not in use. So let us ask you again, will you be ready when an impromptu poker game breaks out? All Nighthawks come with our industry’s best 1 YEAR WARRANTY and free shipping! This Table with any combination of chairs and dining top are Freight Shipped only. We will package in stock Standard orders and ship generally between 2 to 5 days. During peak season, calculate in few days extra. It's always a good idea to get your order in early! (custom orders will ship as soon as they are finished), and transit usually takes less than 7 business days coast to coast.